In the 21st century, M. Kungl has revived the style in his widely acclaimed artwork, infusing it with a modern vitality and relevance. Kungl’s work has attracted the attention of Hollywood and art collectors from around the world. 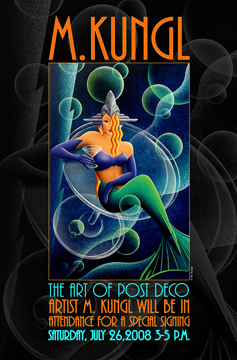 Over 25 of his paintings were featured in the Art Deco home on Ashton Kutcher’s reality show Beauty and the Geek, and his artwork was used to furnish a home included in an episode of CSI. Kungl has also produced a number of works for Disney, including Tinkertini, which features the famous fairy perched on a martini class. Come meet the artist at this very special event at the Jack Gallery. For more information, you may contact us at the M Kungl Studio (714) 838-4800.